The name "white cooper" was given to the man who made the smaller pieces, such as buckets, tubs, piggins, kegs for rum, water and powder and the churns and canteens according to Mary Earle Gould in Early American Woodenware. These piece were of staved construction and "built for sturdy" as they were used and used up. 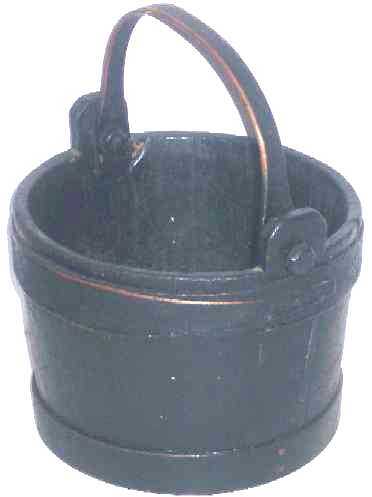 This piece is a water bucket which was made similar to a sugar bucket which are much more plentiful. However, they never had covers and the protruding staves to which the handle was attached allowed for the bucket to stand away from the ground when it was turned over to dry. The surface is wonderful with a crusty Windsor Green Paint that has oxidized to black. The wear is appropriate to its age and use and shows beautifully, especially on the handle, which one would expect. For such an item that was put to such hard usage it is amazing that it has survived and still be so solid. It's a special piece with its fingered laps and great surface. We would conservatively date this to the early 1800's. It measures 7" high to the top of the stave to which the handle is attached and is 8-1/4 inches in diameter at the top.